Bryant Park is a popular place to visit, whether you're a member of the public or a public figure. Here are some of the celebrity spottings we had at the park in 2014. In late September, Clint Dempsey, star forward for the Seattle Sounders and the U.S. Men’s National Team, was in town for the Sounders’ match against the Red Bulls. Dempsey dropped by Bryant Park to shoot a segment with ESPN and in doing so, picked up where Ryan Lewis and Robinson Cano left off in earlier video shoots at the park. Microphone in hand, Dempsey stopped random park visitors and asked them what they thought of…Clint Dempsey. Surprisingly, though Dempsey set a record for the U.S. Men’s National Team at this summer’s World Cup by scoring a goal 34 seconds into the game, most of his interlocutors were clueless that it was him they were chatting with. In October, Vanity Fair brought the cast of the hit revival On the Town to the park for a photo shoot to accompany an article in the magazine that took an in-depth look at the history of that famous show. Then in November, we really hit the celeb jackpot, as Bank of America Winter Village at Bryant Park hosted a skating event after the NYC premiere of the animated comedy Penguins of Madagascar. The film’s stars Benedict Cumberbatch, John Malkovich, and Ken Jeong were in attendance. Also at the premiere, and later spotted at The Rink, were Brooke Shields, Mariska Hargitay, Debra Messing, Debi Mazar, and Ali Wentworth. Great Britain’s Mail Online was there to snap some pics, which you can check out here. Penguins of Madagascar premiere. Startraks, Mail Online. On December 2, actress/singer Rosario Dawson was spotted taking a stroll through Bryant Park. While there, she posed for pics with fans and helped out at the Nescafe “Give with Gusto” promo on The Deck. And the blogosphere lit up big time last week when news broke that Jay-Z and Beyonce were at Bank of America Winter Village at Bryant Park on the evening of Monday, December 15. 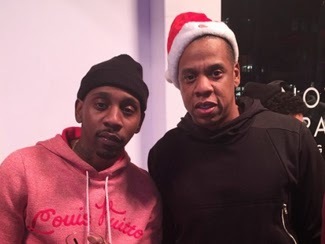 The ultimate power couple came to Celsius and The Rink to attend the holiday bash for Roc Nation, Jay-Z’s entertainment company. Judging from the coverage in Page Six and photos posted on blogs here, here, and here, they seemed to have a good time.